From RogerL of debary, Florida on 10/30/2015 . 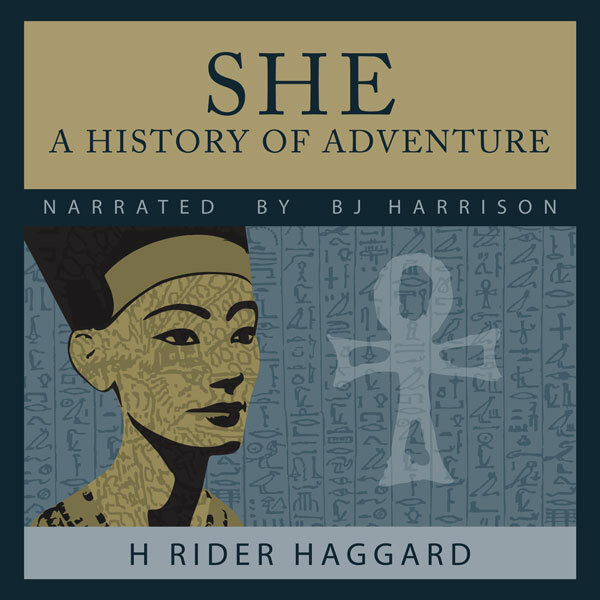 I was fascinated with the book, "She" when I was a kid. King Solomon's Mines" was similar in many ways. It was not a big surprise when I saw that it was the same author. BJ's narration is a work of art. From Ronnie Greher of Liverpool, New York on 12/13/2014 . Another wonderful adventure, courtesy of BJ. I truly felt as if the characters were acting out a play in front of my eyes. I can't say enough what a value this is. Forget the traditional audiobook stores. BJ is your go to place for spoken word production. Thank you for all of your tireless efforts BJ. From Patrick McBride of Indianapolis, Indiana on 11/28/2014 . Another great read - fun adventure novel. 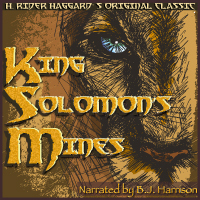 King Solomon's Mines: Crazy Good!! From Jeff Wilson of Humble, Texas on 10/1/2014 . Hands down, the best book the I never read! BJ has literally outdone himself with this latest title. This is one of the many books that I've enjoyed thanks to the extraordinary storytelling and amazing character voice creations that cannot be found elsewhere. BJ's ability to bring the characters to life and tell the story in such a way that makes me take the long way home just to hear more of the recording. Think of it like when a modern singer takes an old, forgotten song and breathes new life into it...making it a sensation like never before. Really, this is the good stuff! From Anonymous of Bethesda, Maryland on 8/21/2014 . I truly enjoyed this title, being a sucker for adventure stories. Well read. From Keith McRae of Rocklin, California on 8/2/2014 . You spend a lot of time driving and BJ's Audiobooks are a fantastic diversion. His podcast is heads and tails above the competition. From Mark Pavlin of Kingsport, Tennessee on 7/10/2014 . This reading is a gem! BJH takes on the challenge of impersonating voices as different as an English gentleman and an African witch in a believable and entertaining way. Nothing distracts from becoming absorded in a classic adventure yarn, a superb job! From Dan Riordan of Sierra Vista, Arizona on 7/5/2014 . BJ is an artist who has perfected his craft delivering the classics in exemplary 21st Century fashion. 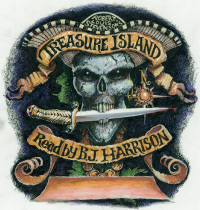 I'm an avid podcaster and audio book connoisseur placing BJ Harrison at the very top of his profession. I just finished chapter 12 and give this audiobook a 5 star plus! Thanks BJ. From FRANK ROGERS of laredo, Texas on 6/30/2014 . BJ, thank you for opening my ears to Classic Tales that I would never experience. King Solomon's Mines, GREAT JOB!!!!!! From John L of Markham, Ontario on 6/29/2014 . 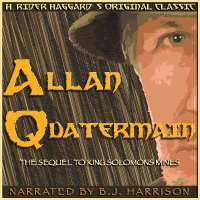 Listning to King Solomon's mines by Rider Haggard felt at times a lot like The Lost World by Sir Arthur Conan Doyle. It's clear that Doyle was influenced by Haggard. This is one of those audio books that can be listened to over and over again. The descriptions of the landscape and people are incredible.